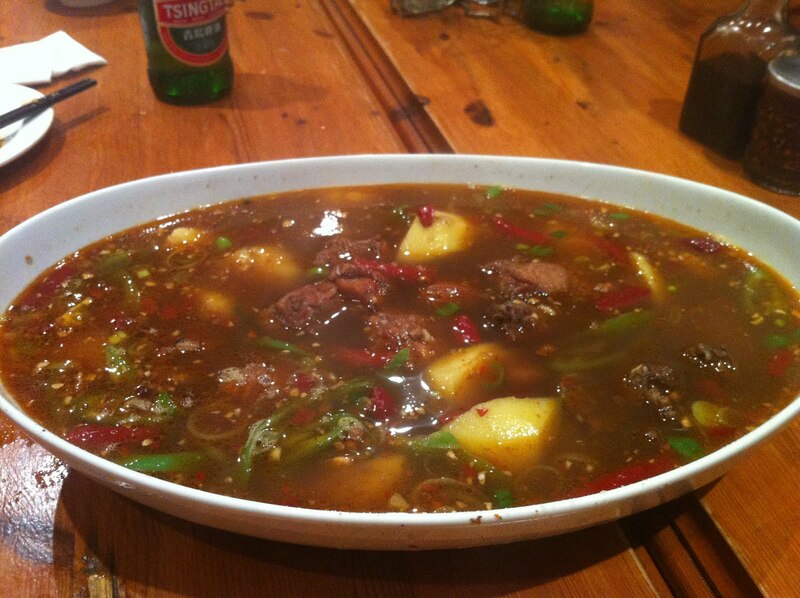 I am yet to find a Sichuan restaurant I don't like. 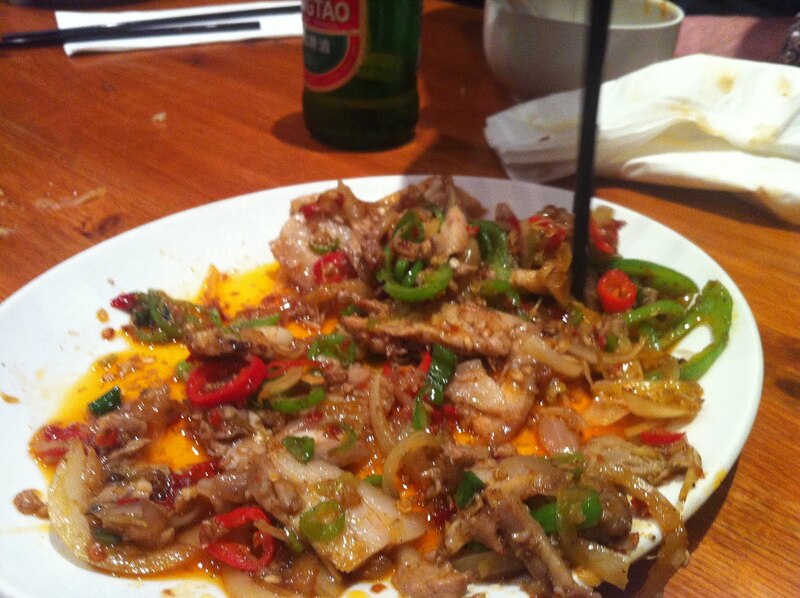 I'm sure there must be bad ones out there somewhere - Chinatown might be a good place to look, God knows there are enough crappy restaurants of other kinds round those parts, but there's something about Sichuan food that seems to guarantee a certain minimum standard. I don't know why exactly that should be, though I suspect it might have something to do with the fact that the level of spicing and uncompromising use of offal in even the most basic dishes means it's impossible to do any kind of toned-down tourist-friendly version, and so anything you end up with is likely to be at the very least explosively hot, powerfully flavoured and containing parts of pig you never even knew existed. However, Silk Road, in common I believe with another of my favourite Chinese restaurants Gourmet San, is not technically strictly Sichuanese - it apparently serves the cuisine of Xinjiang, which means a bit less pork (though based on our meal last night, not actually that much less) and a bit more lamb and cumin. 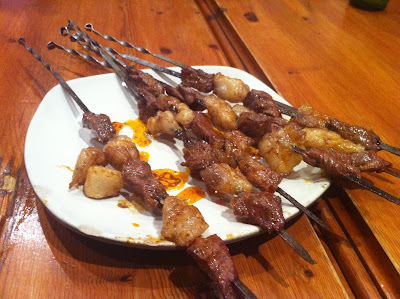 But all you really need to know about Silk Road is that if you have a preference for offal and, it has to be said, the constitution of an ox, you can eat superb food at prices that can only be described as a pittance. Silk Road are rightly celebrated for their fried pork dumplings, made fresh all day and every day and often in full view of the customers at a table towards the back of the restaurant. They are brilliant - crispy on the outside, moist and piggy within - and, for the amount of backbreaking work that goes into them, ludicrously cheap, about £3 for 10. Another street-food starter is the cumin-spiced lamb skewers, charcoal grilled and moreish with the chunks of meat alternating with glistening cubes of lamb fat. We ended up ordering seconds. 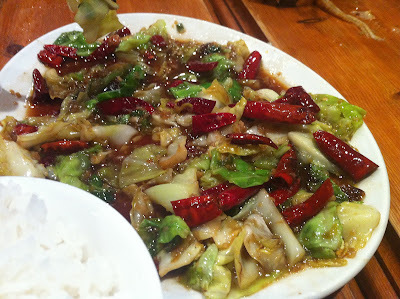 I would like to say that this cabbage dish - beautifully-cooked, crunchy morsels of cabbage in a Sichuan peppercorn and chilli sauce - was one of the greatest vegetarian dishes I've ever eaten in my life. Unfortunately, as with most Sichuan restaurants, I can't be entirely sure that there wasn't some pork lurking in the mix somewhere so I will just have to tell you that it was superb regardless of how it was made. Both lamb and spring onion and double-cooked pork were so tasty about half of each plate had disappeared down the throats of my fellow diners before I'd even unholstered my iPhone to take a picture, so rest assured they were a lot more generously proportioned when they arrived. 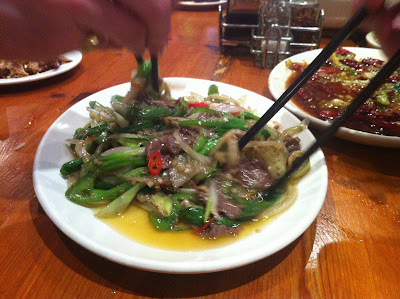 I particuarly enjoyed the contrast between the crispy fried spring onion and the tender chunks of lamb, and the tingling but not aggressive levels of chilli heat in the pork. 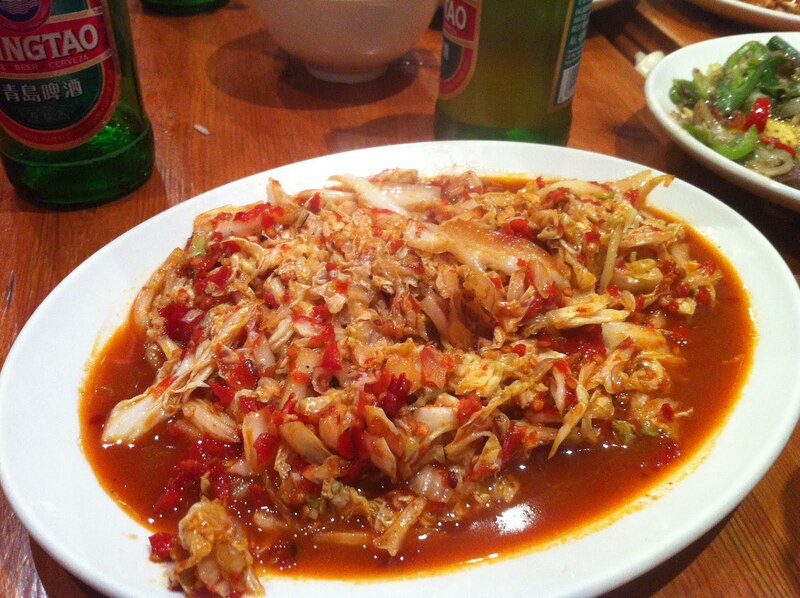 Aggressive is, however, the best way of describing the fierceness of this hot cabbage dish, of which barely a mouthful had me desperately downing the rest of my Tsingtao. Despite the eye-watering chilli, however, it was still supremely flavoursome, vinegar providing a nice acid counterpoint to the vegetable. The centerpiece of the meal was this huge bowl of vegetable-chilli broth in which chunks of potato and chicken were slowly poaching. After we had cleared sufficient space in the bowl by snaffling down the chicken and potato, a waiter brought out a generous serving of thick "belt" noodles which soaked up the rest of the sauce and made a filling and enjoyable second course out of the same dish. 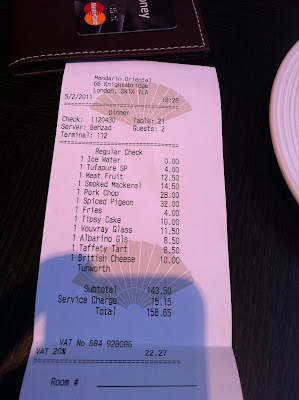 Our bill came to around £20 a head, about half of which went on far more beers than is probably healthy, and I'm pretty certain that you could eat a feast here for just over a tenner - for food of this standard, little short of miraculous. 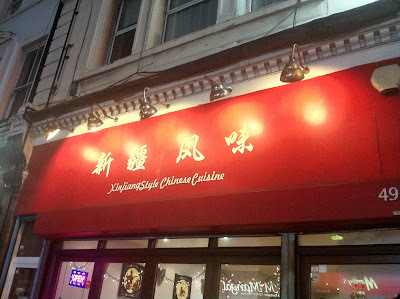 In fact, it's so cheap I found myself wondering if the guys behind Silk Road shouldn't just charge a bit more and live a little - there surely can't be anyone in London who wouldn't pay 40p a dumpling instead of 30p, or slightly over retail for a Tsingtao. 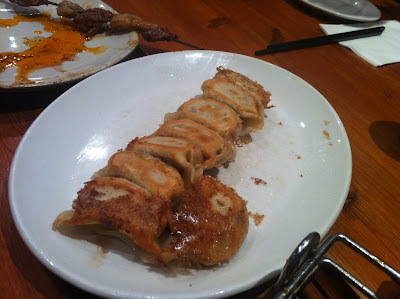 But who are we to complain - for anyone that ever moaned about eating out in London being an exercise in how much a restaurant can fleece you before you got out of the door, Silk Road stands as a beautiful rebuttal; a charming, big-hearted place where the food comes first and the prices are guilt-inducingly low. A gem. It has become an accepted fact, repeated almost to the point of cliché, that London does not do good Mexican food. 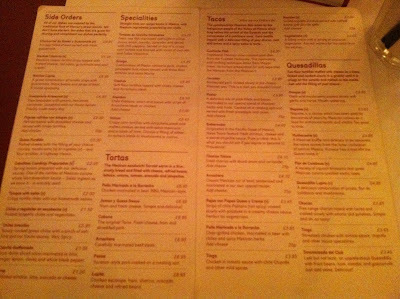 And this is very strange, because not only are there a huge number of Mexican restaurants in the capital - at least 80 according to London Eating - but not all of them are terrible. Admittedly, most of them are; it must say something that two of the worst meals I had last year, at the trashy and way too expensive Cantina Laredo and the utterly diabolical Tlalocan were both at Mexican restaurants, and I can't honestly say I'm dying to try out the Leicester Square branch of Chiquito or, based on the reviews, spend an evening in Desperados in Greenwich. But I enjoyed my meal at Wahaca far more than the sub-£15 a head price tag would suggest, and I'm also very partial to a loose-meat beef taco from Daddy Donkey's stall on Leather Lane. I would hesitate to dismiss the idea of any high-end or "gourmet" Mexican, as I'd like to think every world cuisine deserves a chance to get "poshed up", but perhaps the secret of Mexican food in London is to keep it simple. Into this hardly saturated marketplace, then, steps Lupita. Tucked away around the back of Charing Cross station, it's a tastefully if minimalistically decorated restaurant hung heavy with the smell of charcoal-grilled meat. And being the world's biggest fan of the smell of charcoal-grilled meat, I was therefore put in exactly the right frame of mind to enjoy what had been billed as a Mexican "with a difference". No Tex-Mex rubbish, this, I was promised, but fresh and unusual (for here at least) ingredients and interesting dishes that showcased just the kind of food that us poor deprived Londoners had been missing out on all of these years. I was hungry, and excited. 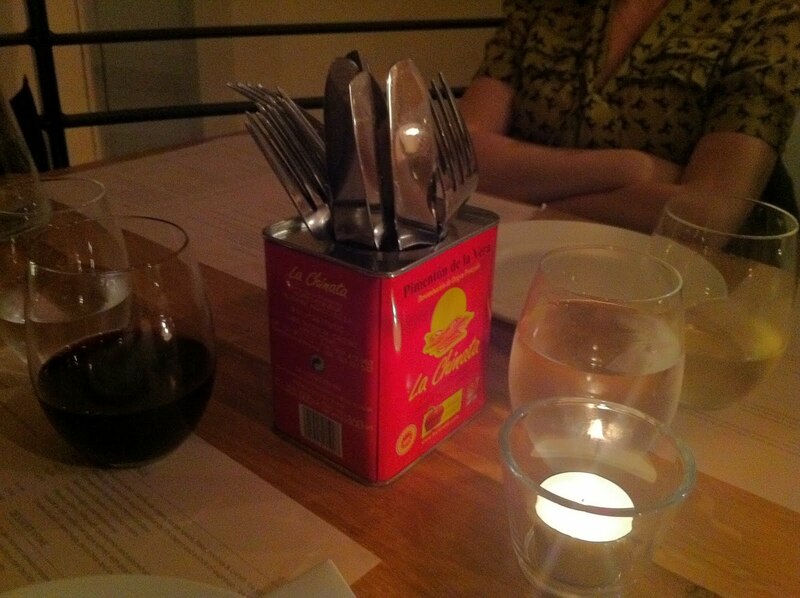 And then - barely a minute or two after we'd ordered it - the food arrived. Worried at first we'd ordered too many dishes, it was relief touched with a note of disappointment to discover just how small some of them were. 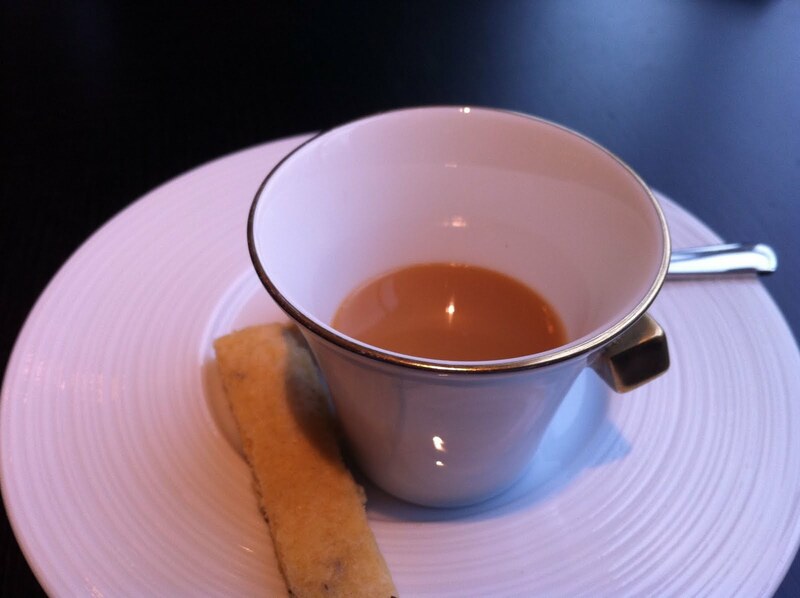 And that they were small wouldn't itself have been too much of an issue had many of them tasted of much. 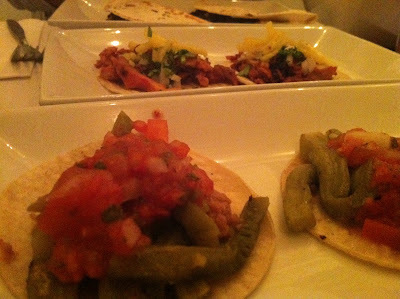 We had three different types of tacos, a sweet and surprisingly bland one for something containing both pork and bacon; a lukewarm underseasoned vegetarian one that contained slithery slugs of nopales (cactus); and one consisting of small chunks of bland beef which was billed as having been marinated in "our own special recipe" but didn't taste of anything much more than plain grilled beef. Expecting a bit more fire and zing and wondering whether we were just expected to provide our own seasoning with the supplied sauces, it was even more disappointing to discover that even the 'hot chilli' sauce that our waitress had gone so far as to warn us about ("it's very hot, be careful") was so bland we could quite easily eat big oily spoonfuls of it on its own. Also, I'll give Lupita the benefit of the doubt and assume that the fragile and overwhelmingly powerful (that masa flour really has an extraordinary strong flavour) taco casings are authentically Mexican, but it doesn't mean I have to like them. 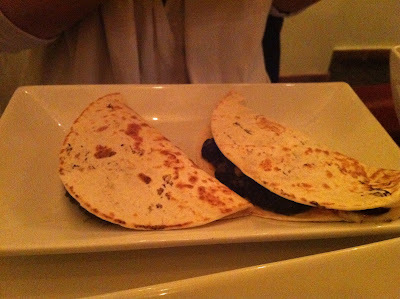 Huitlacoche quesadilla was reasonably interesting - mushroomy and thick and black like vegetarian squid ink. But it again was underseasoned and I think describing it as the "Mexican truffle" is overstating it somewhat - it was, all said, a mushroom quesadilla, not unpleasant but hardly earth-shattering. And chiles y vegetales was just cold, slimy vegetables, resembling old ratatouille, topped with pickled jalapenos. In fairness, the jalapenos were nice and, unlike everything else on the table, surprisingly fiery, so at least we got our chilli hit from somewhere. I did, thank God, enjoy two of the dishes. 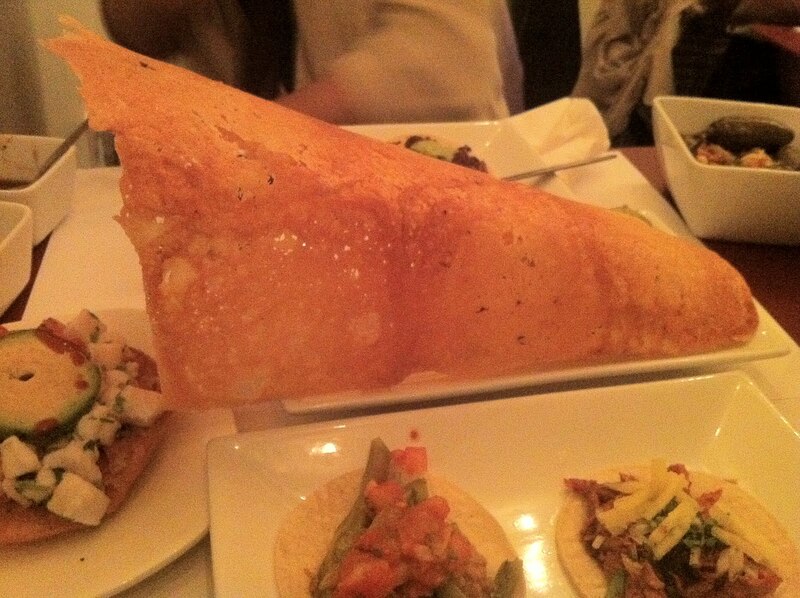 Chicharron was a huge sheet of baked cheese which you break chunks off to scoop up the excellent Guacamole underneath, and was enormous fun. 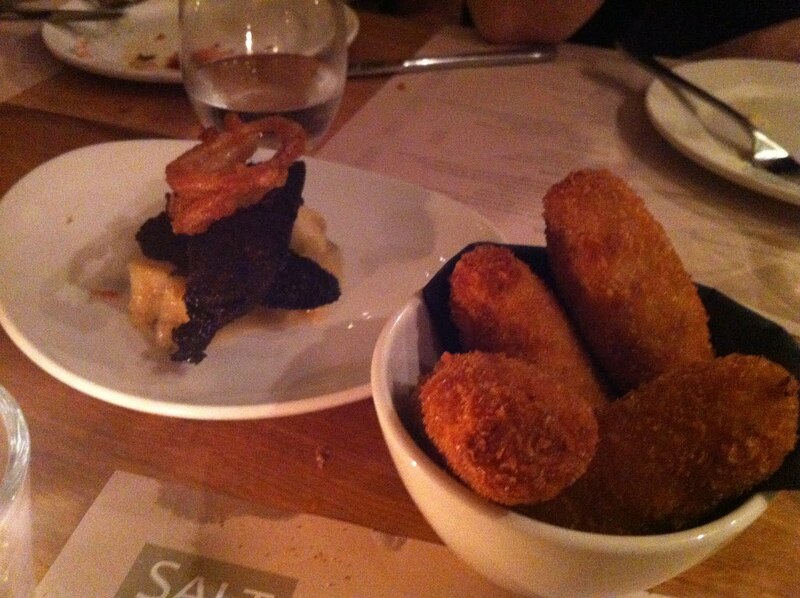 The salty, crispy cheese made a perfect accompanyment to the soft rich guacamole, and although you'd hope to enjoy it for £7, it was - unlike most of the other courses - interesting, tasty and generous in proportion. 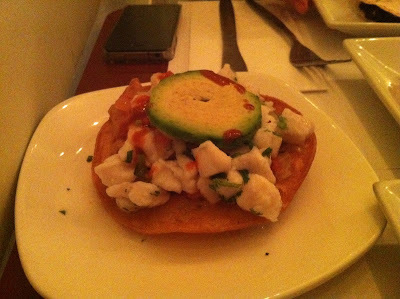 Excellent too was tostada ceviche, which contained marvellously moist and flavoursome chunks of white fish, a delicately crusty base and a good fresh dressing. 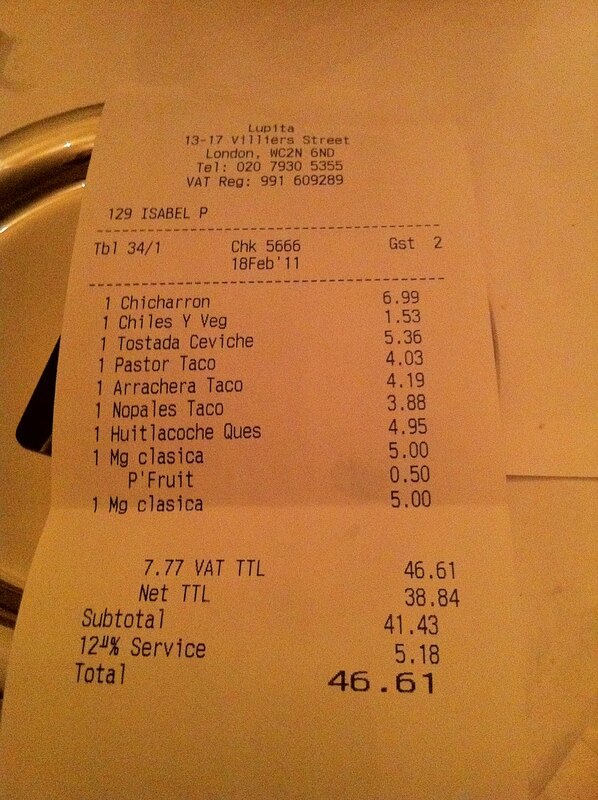 It was barely a mouthful of food for over £5, although I'm sure a lot of effort went into its construction. With a (nice enough) margarita each the bill came to £46 for two, and although this isn't a fortune by London standards, it is quite a lot considering we left if not hungry then not full, and hardly impressed by much of what we ate. I can see what Lupita are trying to do, and certainly somewhere attempting to produce anything Mexican other than cheddar nachos and burritos needs to be encouraged, but I got the impression that a lot of these dishes held a promise of tasty food that hadn't, for whatever reason, quite been allowed to make good. If I'm in this part of town again with a craving for tacos, I'll head for Wahaca - it's not perfect, but it's just that bit better, and cheaper, than Lupita. 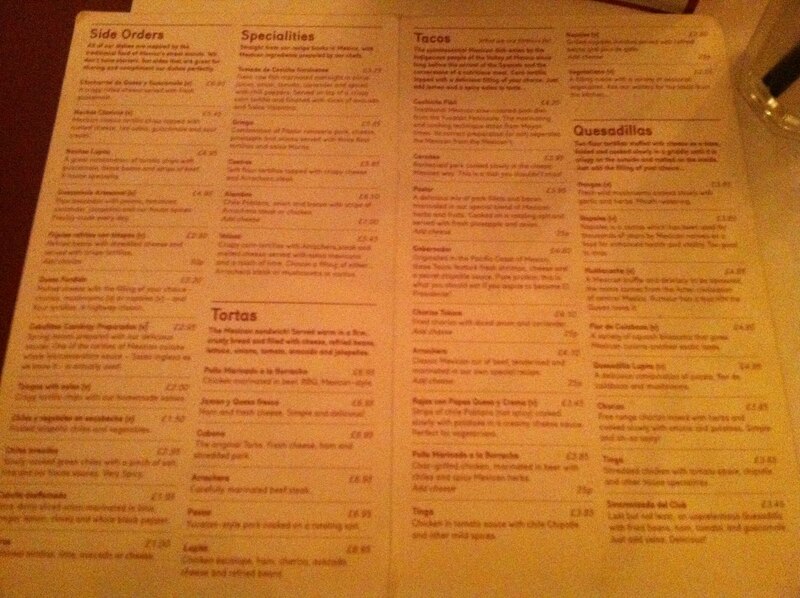 And in a town with quite so many terrible Mexican restaurants as London, that, for now, is good enough. At first, I thought I'd turned up at the wrong place. Normally you'd expect a smart Italian restaurant in Mayfair to be visited by smart Mayfair types, and indeed there were a few in evidence last night; portly old men in dark suits with their bejewelled and be-frocked wives. But mainly this comfortable and attractive room was populated by table after table of Japanese - at a rough guess I'd say at least half the customers once all the seats were taken (and they all were) by the middle of the evening. It turns out that the chef at Tempo - a certain Yoshi Yamada - has quite a following in his native country and despite (or perhaps because of) the very traditionally Italian food served, seeing so many Japanese faces here is a regular thing. 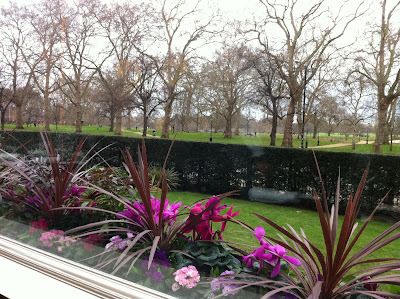 It may be tempting to make a quip about national stereotypes and 'following the flag', but based on just how many British visitors to New York flock to Gordon Ramsay's (very average by all accounts) restaurant at the London Hotel, it's clear that such gastro-tourism isn't confined to just one country. In any case, the clientele at Tempo have a much more important reason to visit than to gawp at a celebrity chef - the food is really bloody good. The sight of the house bread briefly gave me a hideous flashback to Dego, but despite the similar styles and shapes these, thank God, were a world apart. They weren't stale, for a start. 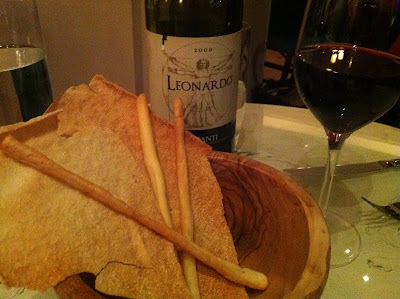 More than that, though, the focaccia was moist and moreish, the bread sticks flavoured subtly with caraway seeds, and the large crispbreads were oaty and beautifully seasoned. 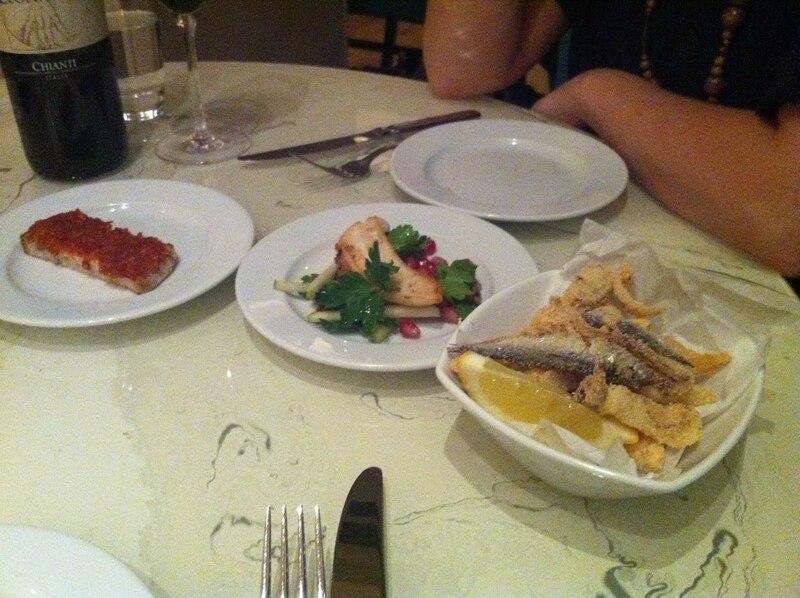 All three cicchetti that we tried were excellent. The fried seafood, crumbed in polenta I think, were greaseless and the whitebait in particular had a fantastic flavour. It was also nice to find a whole baby squid in amongst the other larger pieces of calamari. A single chunk of octopus tentacle had a delicate crisp on the outside and full flavour within, and came with a nice sharp parsley and pomegranate salad. But best of all was a simply astonishing N'duja sausage crostino, shockingly chillified and satisfyingly piggy. 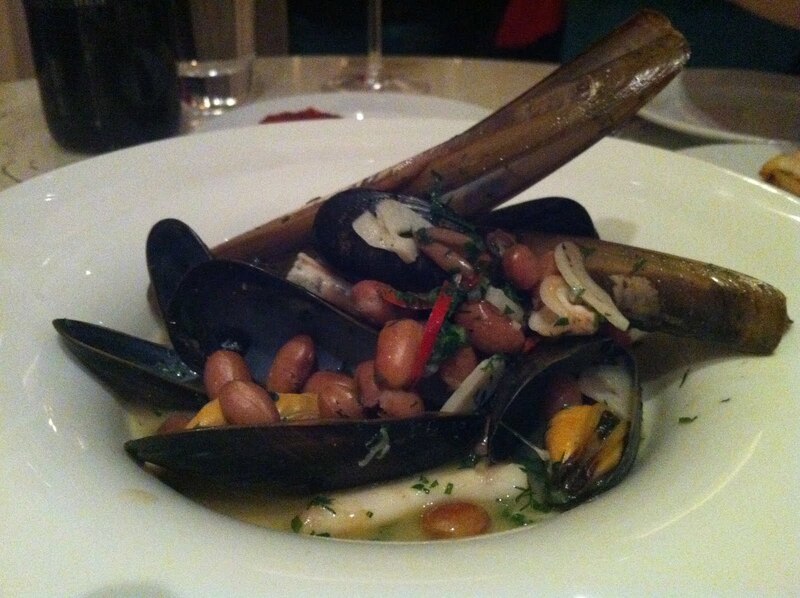 This mussel and razor clam antipasti had a decent (if slightly under-seasoned) broth and contained good fresh seafood, but the real star of the show were the borlotti beans which added a buttery richness and interesting texture. 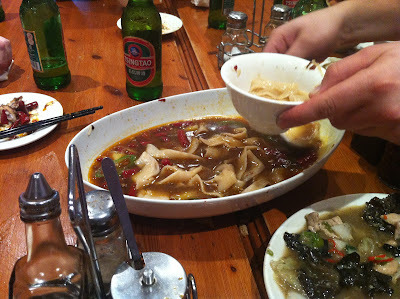 I also liked the huge chunks of garlic. Wild boar pappardelle was another top dish; lovely firm eggy pasta topped with a heady, gamey ragu flavoured - as my friend spotted - with bone marrow for extra unctuousness. 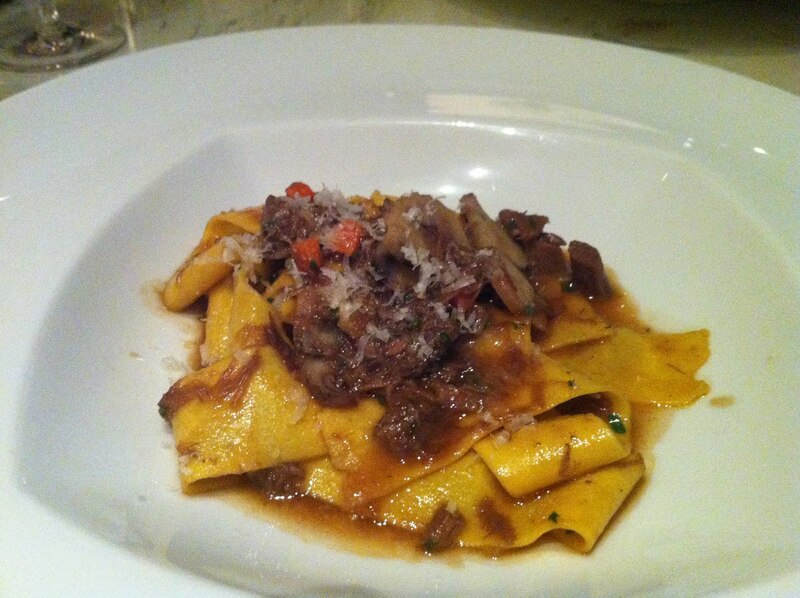 It was seasoned well and the thick ribbons of pasta were silky and delicious. 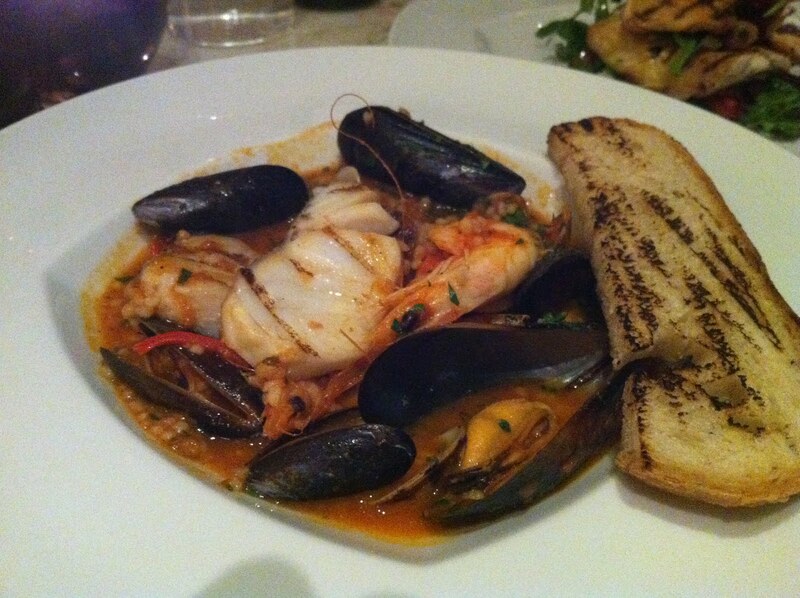 It was probably only the contrast with the extremely the high standards of the previous dishes that meant I didn't quite enjoy a fish stew as much as I thought I would. Although one particular element - a heavenly charcoal-grilled (I think) chunk of smoky white fish - was brilliant, the other bits including the broth were rather one-dimensional for a plate of food costing the best part of £20. Similarly, baby chicken (sorry, polletto) had a nice crispy skin but the thigh and breast portions were noticably more moist and tasty than the slightly overcooked legs. No disasters here, with either dish, but no fireworks either. Those would have to wait for the dessert. 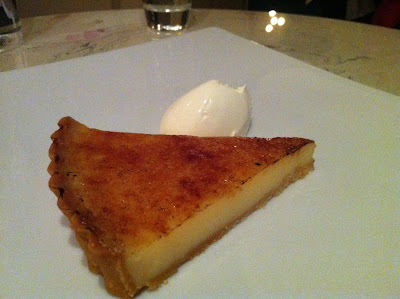 "The best lemon tart I have ever eaten in my life" my friend said, and she is not normally easy to impress. An impossibly delicate toasted sugar crust topped a light, citrusy filling, all supported by a perfectly judged pastry base. The wobbly lemon filling dissolved like warm jelly in the mouth, and if the tart itself wasn't brilliant enough, taken with the slightly soured cream the contrast between sharp and earthy, sweet and sour was extraordinary. It was a pudding so perfect, so completely satisfying on every level that even if nothing else the whole evening had been edible the trip to Mayfair would have still been worthwhile. Heavenly. 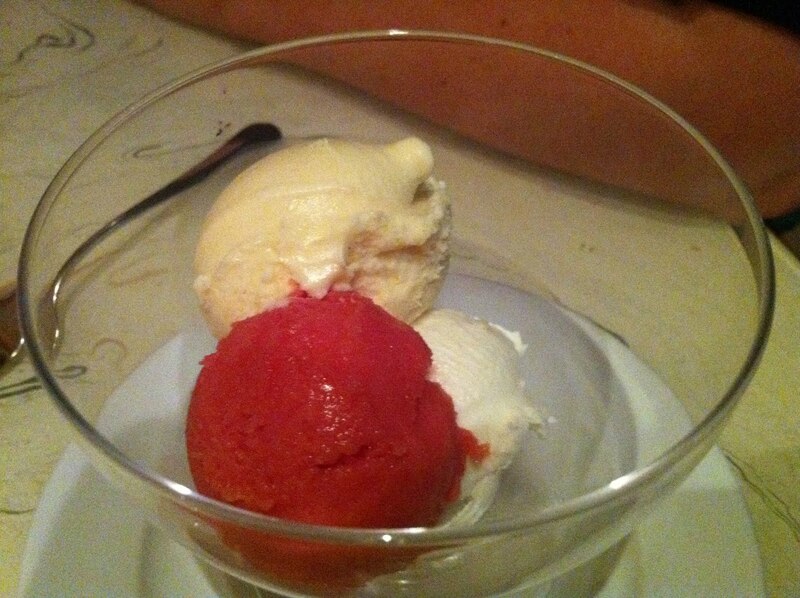 Oh, some ice creams and sorbets were quite nice too, particularly the mascarpone one. Tempo is, by anyone's standards, a very good Italian restaurant and although you would hope so at these prices (we didn't pay but I imagine if we had there wouldn't have been much change from £150 for the two of us), being expensive and being in Mayfair is no guarantee that a place is going to be any good - just look at Theo Randall. 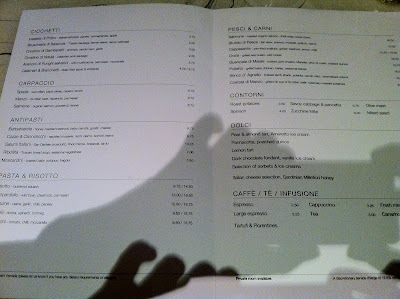 The lows were never too low to be uncomfortable, and the highs - I'm thinking particularly of the house bread, the n'duja crostino and That Lemon Tart - were occasionally stratospheric. Last night I learned that the country of your birth need have nothing to do with the type of food you cook, that the owner of Tempo is mates with Jeffrey Archer (true story), and a lemon tart can be a life changing event. And most of all, the Japanese have excellent taste in restaurants. I was invited to review Tempo. 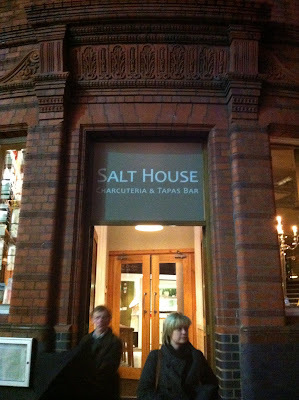 It must be very, very hard work opening a restaurant like Salt House in Liverpool. I have no doubt it's very hard work opening any kind of restaurant anywhere, and quite frankly having heard some stories from traumatised restaurateurs I can't believe anyone would voluntarily choose to make their living this way, but new places outside London must have their own particular extra set of challenges. Were it in London, Salt House would do very well, serving largely authentic (whatever that means these days), technically impressive Spanish tapas using fresh ingredients and matched with decent Spanish wines, and its existence (and continued success) would be something the owners should be proud of. To perform the same feat in Liverpool, a city which only recently got its first Wagamamas and where the population are, without wanting to sound patronising, not quite as cosmopolitan as diners from the capital, is an achievement to be cherished. 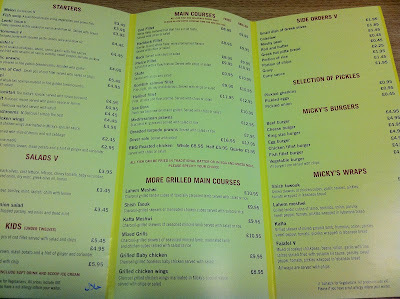 I hesitate to make any wild generalisations about Liverpool diners, and God knows they have a better choice of places to eat than most other areas of the North West (good luck trying to find somewhere even half decent in Manchester), but there was something in the way our Spanish waiter nervously described the menu to us - "tapas dishes are only quite small so I suggest you order three per person" - and his response when we selected a £14 tray of Iberico ham - "it's just sliced ham, it doesn't come with any sides" - that suggested the reaction of the public to this menu, priced very much at the "reasonable" end of what you might expect to pay in London but fairly ambitious for Liverpool, has not always been understanding. Which is a shame, because as far as the food is concerned, Salt House really shouldn't have anything to be nervous about at all. Some good artisan sourdough (from a local bakery I believe) began proceedings, and was shortly followed by a small dish of plump, perfectly cooked prawns in garlic oil and some impressively tender (if slightly greasy) calamari with decent aioli. With tapas restaurants more than almost any other you can tell how a meal is going to go after a couple of mouthfuls of the first dishes, and these got events off to a very promising start. And from here on, up to a point, things just kept getting better. 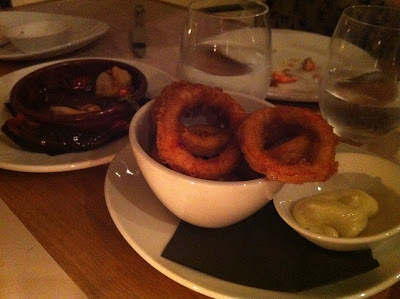 Morcilla with apples and sage was just brilliant - the pudding soft and piggy and topped with a couple of dainty, crunchy onion rings for texture; it disappeared in seconds. With this came four piping hot Iberico ham croquettas, whose breadcrumbed surface contained a rich, salty béchamel mixture as good as I've ever had in Spain. They were absolutely massive for £5.50, too. Instead of trying to cook a perfectly moist pork belly and get a good crackling in the same piece of meat, I will forgive the Salt House for cheating slightly by cooking the main flesh sous-vide (presumably) and placing a crunchy bit of crackling prepared separately on top. 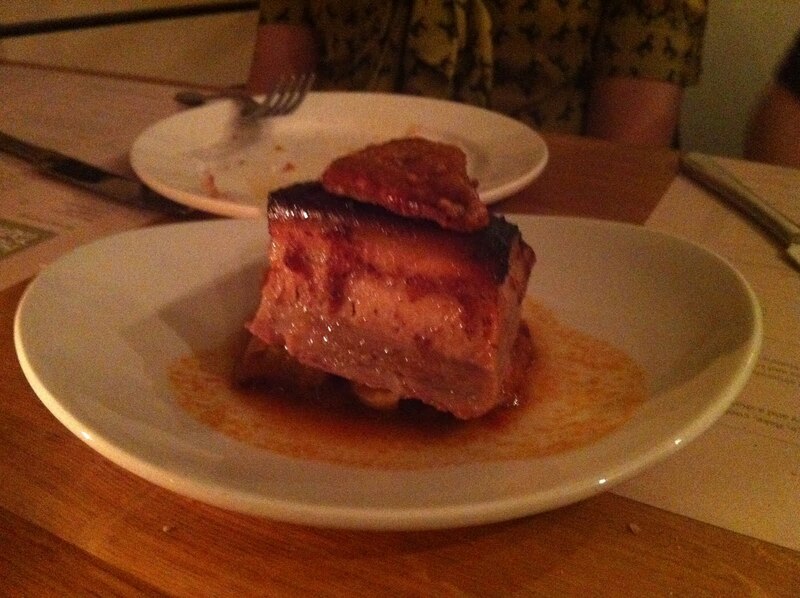 And I forgive them because the results were so spectacular - an unbelievably tender pork belly, as light as a soufflé, in a delicate quince and chorizo glaze that made the whole thing a joy to consume. Perfect. I don't like people messing about with my cheese courses, and I would have been quite happy if the advertised Picos de Europa, Manchego and Monte Enebro came simply sliced on a tray, perhaps with some quince membrillo if you insist. 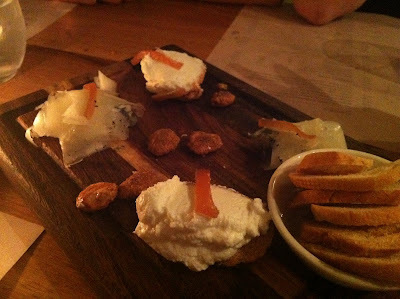 Unfortunately the fussy presentation detracted from what are usually three top quality cheeses, particularly the Monte Enebro which if I didn't know better had morphed into a completely different goat's cheese altogether... I'll give them the benefit of the doubt as we didn't complain and I didn't see the pre-messed-about-with article, but it certainly didn't look or taste like any Monte Enebro I've ever tried. Oh well. Fortunately desserts put events back on track. 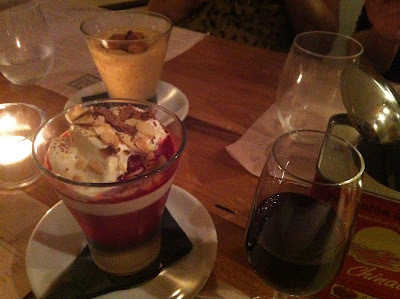 A turron caramel mousse contained generous large chunks of turron in a light and tasty mousse, and an Oloroso trifle was pleasingly alcoholic with a good soft jelly. I should also mention the glass of Pedro Ximinez we had with these, which I enjoyed so much I came back into town the next day to try and find a bottle for myself; whether the one I in fact ended up with (from Lunya's deli, just up the road) was the same I'm not sure, but here's hoping. 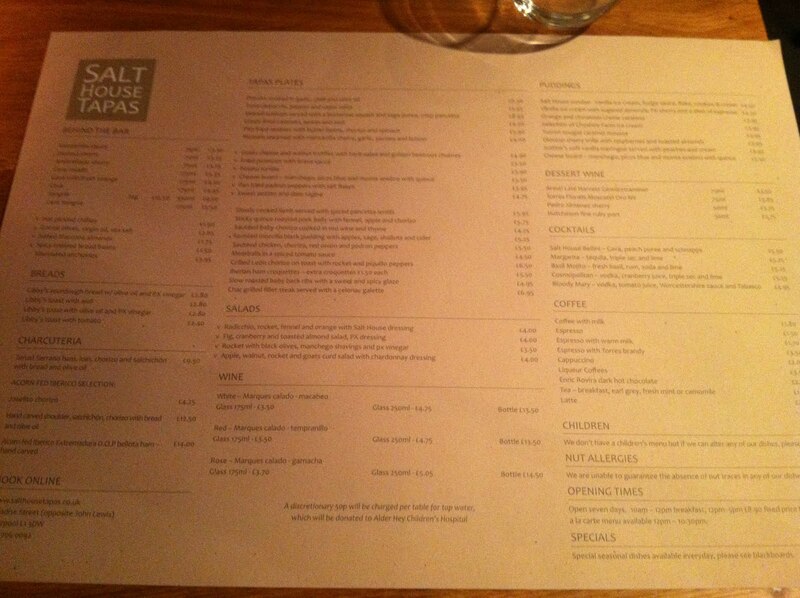 So apart from that weird cheese course, I enjoyed everything about the Salt House. The service coped with our requests for a particular table (we hadn't booked) and me changing my mind about whether to order a glass of wine or a bottle (no prizes which option won) with good grace and the flow of all the dishes felt relaxed and comfortable all evening. It's a nice, tastefully-decorated split-level room which never got too noisy despite the presence of a couple of large tables of merry tourists, and even the toilets, two flights down and seemingly carved out of bare rock in the very bowels of the earth, were clean and spacious. 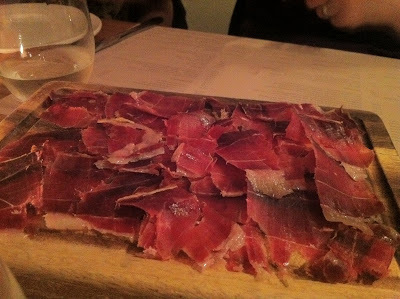 I have a feeling we have the trailblazing Lunya to thank for this unapologetically Spanish meal, who presumably found suppliers and tested the Liverpudlian waters with premium acorn-fed hams and dry sherries a few months before the Salt House did their own thing. But in the end, the real winners are us - where Lunya felt unsure and unpolished, the Salt House was assured and technically polished. The Iberico ham I'd had in Lunya last year, although tasting as good as ever, was sliced badly and pointlessly dressed with pickled figs as if in apology for having to charge you so much for "just sliced ham". 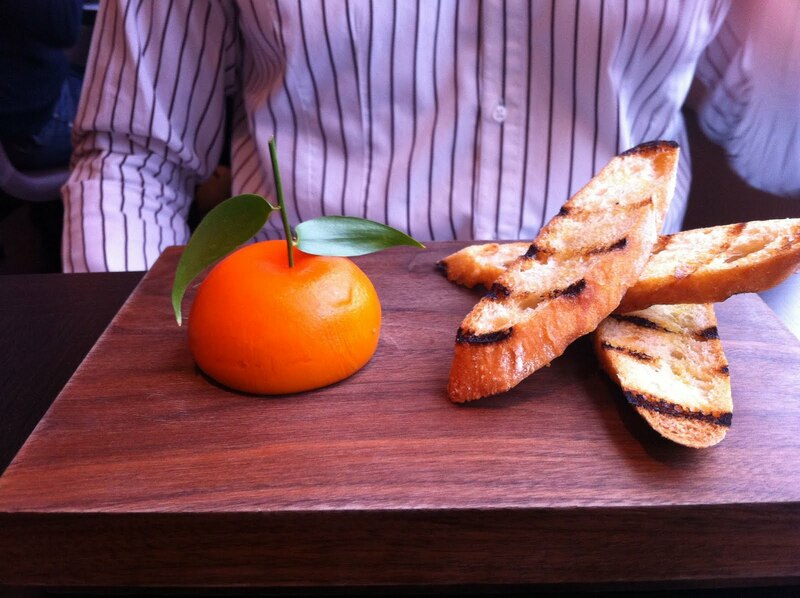 Here, it was wafer thin, glistening with fat and presented in neat slivers on a plain wooden board. And if there's one thing in the world guaranteed to make me feel good about a restaurant, it's a glass of Spanish sherry and a board of neat slivers of Iberico ham. I will be back. Until very recently, there was a little kebab shop on High Holborn called Safadi Express. 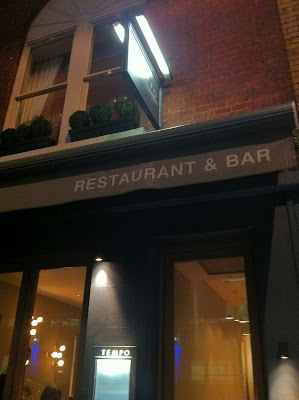 I'm not going to pretend it was great, because it wasn't, but given the choice between that and Eat and Pret and Eat and Pret ad infinitum in this part of town, it was clean and friendly, served nice fresh charcoal-grilled chicken wraps and did a generous portion of hummus and warm flatbread for £3.50. I went there quite often and never had cause to complain. Then one day last week, I popped down to street level at lunchtime and noticed it was all boarded up with a sign saying 'closed for refurbishment'. 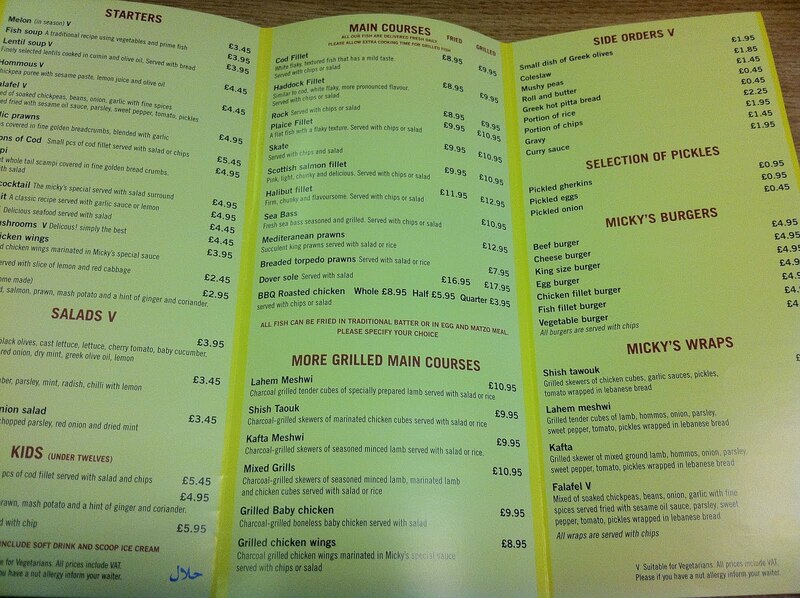 And barely a couple of days later, a garish blue frontage had replaced the old one, declaring the new resident to be Micky's Fish Restaurant and Takeaway, "Established 1962", "As seen on Heston Blumenthal's In Search of Perfection". Presumably that refers to a different branch somewhere else as I know for a fact this one has been open 5 days, not 5 decades. 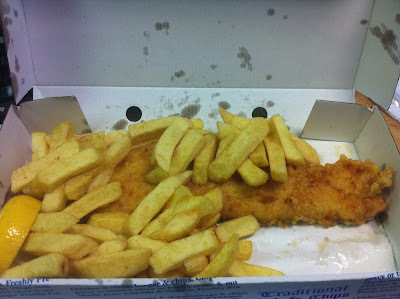 I thought I'd give it a try anyway, as a decent fish & chip place is a very valuable thing to have within seconds of the office. If the speed of the "refurbishment" and change of tenant was surprising from the outside, once inside it all made sense. Apart from new heat lamps for the fried products, and the addition of a bottle of malt vinegar on every table, barely anything had changed from the old place. There was still a glass cabinet selling trays of baklava, the tables and chairs were the same, and the ropes and tills and queuing process seemed identical. Even more weirdly, the staff seemed largely the same, too, as if they'd turned up for work as normal on a Monday morning only to be told they'd be serving fish and chips instead of kebabs from now on, and to get on with it. And if all that wasn't strange enough, I was handed a menu, which was exactly the same size and shape, with the same font and layout as Safadi Express. 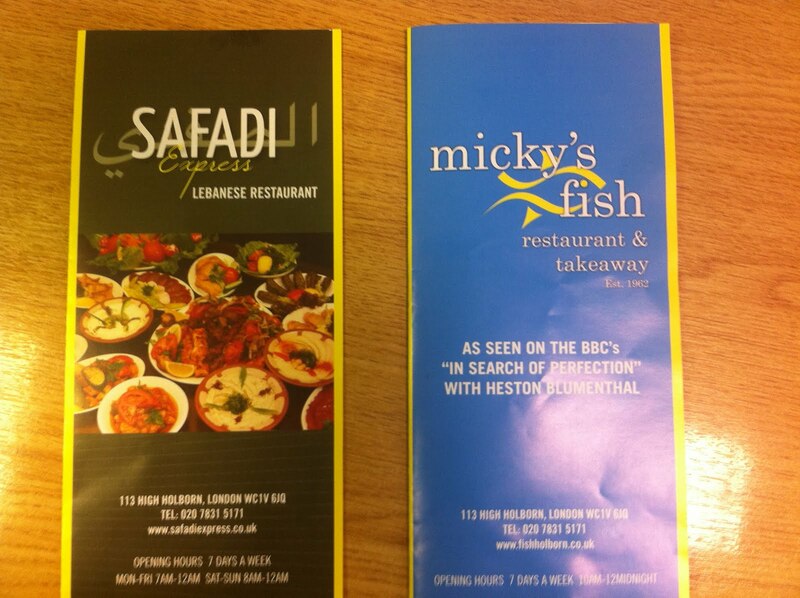 And then the penny dropped - the similarities between the two enterprises were just too great for Micky's to be anything other than a new venture from the same company, who clearly think that knocking out fish & chips requires exactly the same skill set and attitude as hummus and flatbread. How wrong they are. 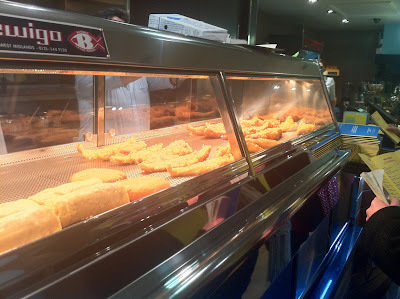 I knew the fish was wrong even as I queued to pay - they looked limp and sad under the heat lamps, and there was something worryingly... rubbery about the way they moved when picked up to be boxed for order. But I was past the point of no return by now, so ploughed on anyway paying my £8 and taking the box back up to the office. 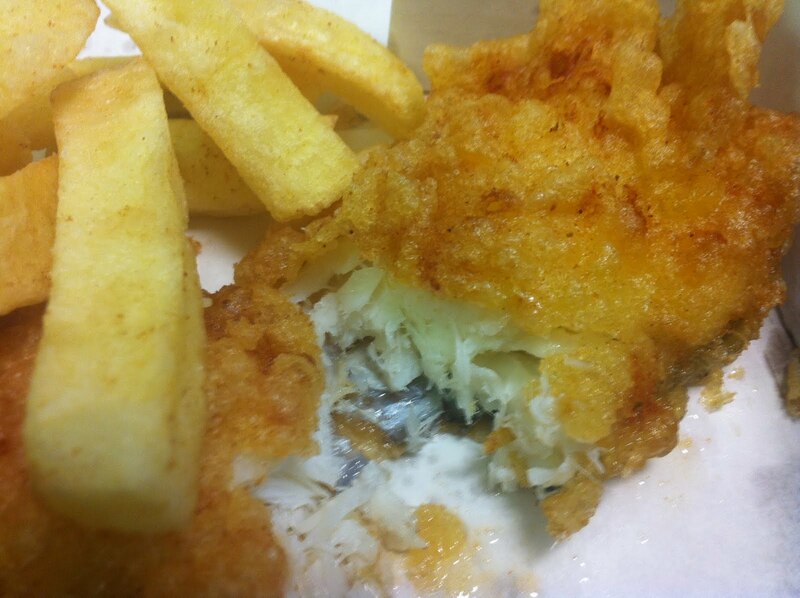 The haddock was, as I'm sure you have suspected from the rather protracted build-up, a disaster. Overcooked to a formless, dry paste inside and encased in soggy, chewy batter that required quite a bit of sawing to get through, it was lucky I had a proper metal knife from the office kitchen to use as the supplied plastic utensils wouldn't have been anywhere near up to the task. There was also a faintly funky smell from the hardly fresh fish, as if I needed any more reason to hate the thing. In the interests of fairness, the chips were fine, a good shape and creamy inside, although I detected hardly any of the requested salt & vinegar. Yeah, I'm clutching at straws. It was bad. So there we have it, another mediocre London fish & chip shop to add to the long list of others to avoid but, you're possibly thinking, hardly worth getting so upset about. Why make an example of this place in a town where it's not even close to being the worst way of spending your lunch money? Maybe it's just something about the way it came into being; a careless, hastily rebranded corporate exercise by a group of suits who one day decided the profit margins were better from battered sausages than falafel. And perhaps also it's what the whole sorry affair says about the British attitude to eating out - that if you can't make it a franchise and farm it out to untrained grease monkeys on a minimum wage then it's not worth doing at all. 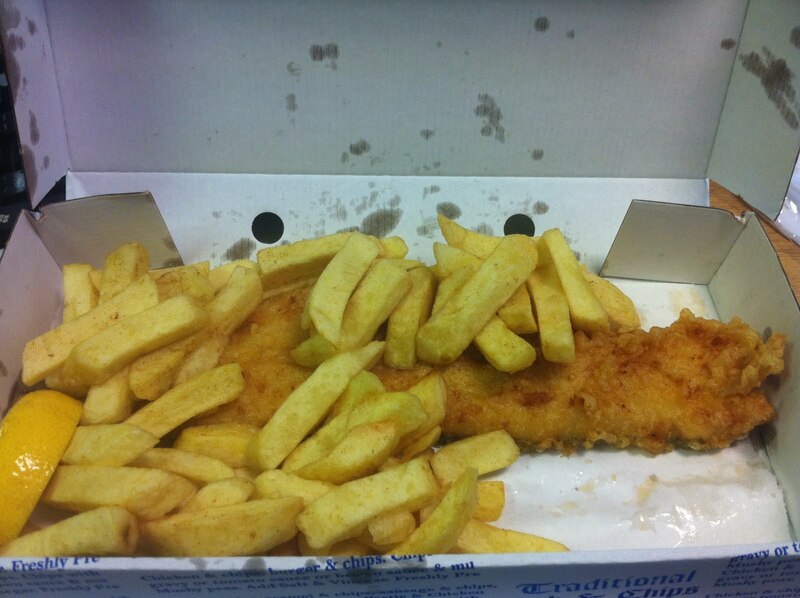 But mainly, it's because I paid £8 for very poor fish and chips. And that makes me sad. If there existed a movie that all your best friends loved, had received rave reviews from every movie critic on the planet, and had smashed all box-office records, would you be interested in seeing it? The answer seems obvious - of course you would, even out of sheer curiosity, and although there would be a risk your inflated expectations didn't quite match up to the reality, you wouldn't blame anyone but yourself, you'd probably still have a good time, and anyway what do you have to lose? And yet for some reason, when a restaurant receives similarly universal praise, there are certain parties who, instead of wanting to see what all the fuss is about, instinctively brace to the opposite position, desperate to not debase themselves by accidentally having anything so trivial as a popular opinion. I find the psychology of this quite hard to fathom - why would you deny yourself the pleasure of a fantastic meal just to mark yourself as separate from the herd? There's no shame in liking somewhere good, even if everyone else likes it too. I can understand why you may get bored by the reams of gushing text on Twitter and press and food blogs of course, but to deliberately avoid somewhere just because it's popular, or - even worse - to set out determined to hate a place before you've taken your first bite in order to position yourself as the sole arbiter of "reason" and "perspective", seems incredibly arrogant. To repeat: there's no shame in liking somewhere good. Sorry to start off this post on such a belligerent tone, but I promise my motives are benign - I just want to persuade as many people as possible, including - and in particular - all the nay-sayers and hype-averse and deliberate contrarians, to book a table at Dinner by Heston Blumenthal. 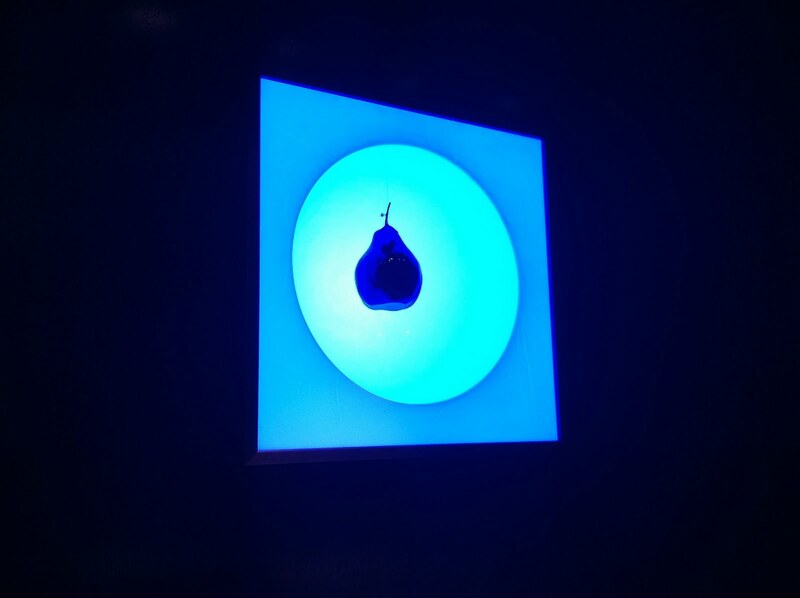 I don't care if you're bored senseless with the coverage, if the merest mention of "meat fruit" turns your stomach or if you want to gouge your eyes out whenever you see the phrase "spit-roasted pineapple" - everyone should have a meal at this dazzling, spectacular, wonderful new restaurant. We may as well start with the meat fruit - if I'm going to provoke the anti-hypists, I probably can't do much better than with this, the most exhaustively investigated dish. 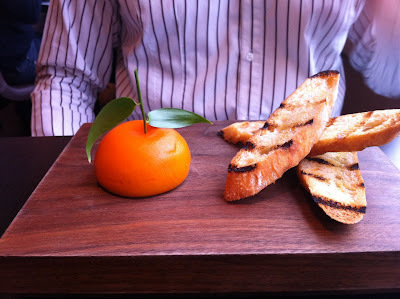 Looking for all the world like a slightly saggy but authentically textured tangerine, the fruit "skin" contains a subtly alcoholic, deliriously light and rich chicken and foie gras parfait, which spread easily on the crunchy rustic loaf provided. The orange wasn't just a visual trick either - the citrusy casing added a sharper note to the rich filling and made the whole that much more enjoyable. Unique and tasty and very impressive indeed. 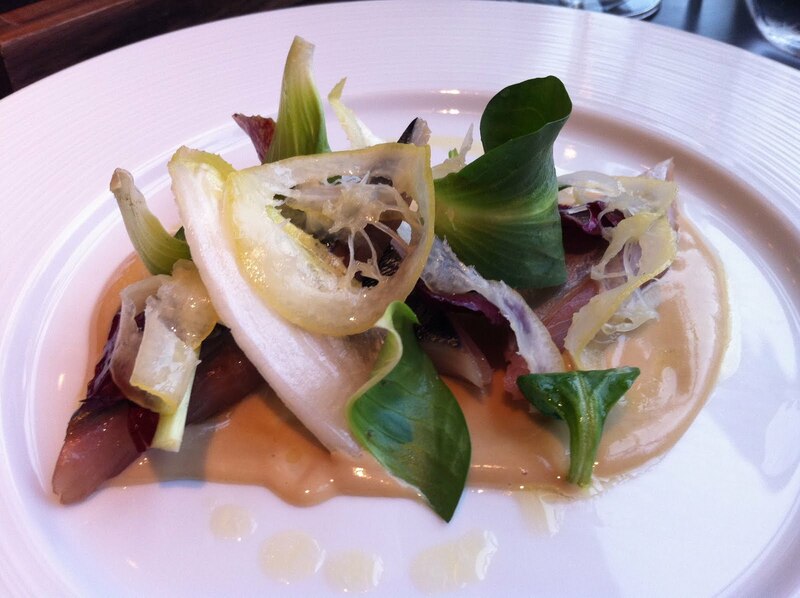 Another starter of Hay Smoked Mackerel was no less accomplished. Some moist and fresh slices of delicately smoked mackerel fillets came nestled in a salty anchovy sauce and dressed with some bitter endive leaves and thinly-sliced pickled lemon. 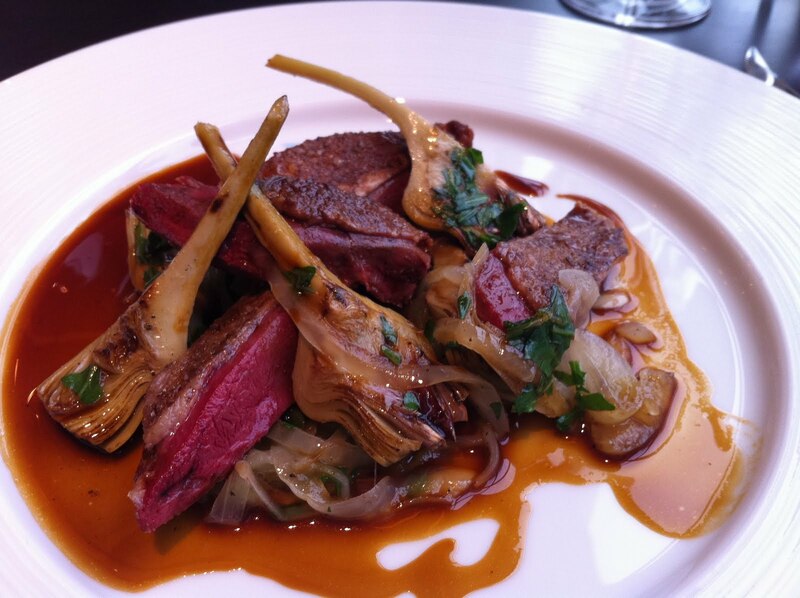 It was a combination of flavours and textures that showed a masterful technique but also, even more importantly, real imagination - a memorable and hugely enjoyable dish. 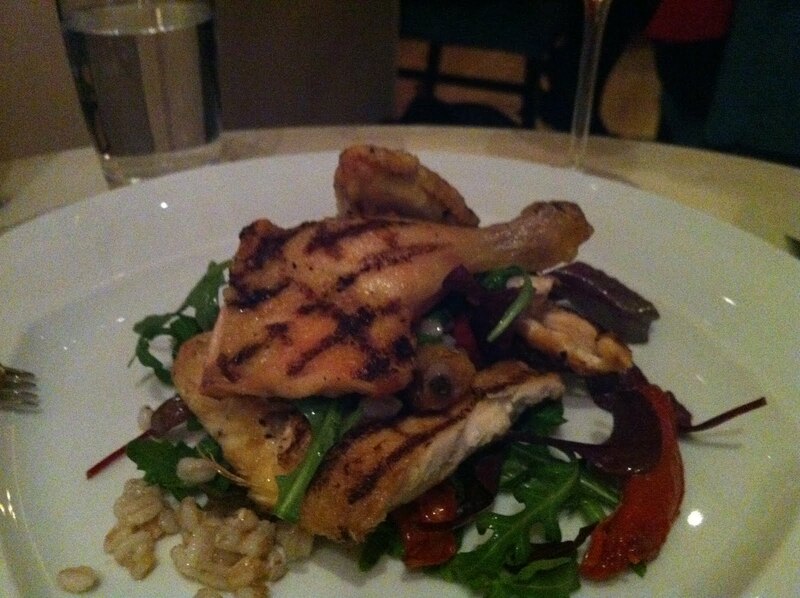 I don't know what strange alchemy Professor Heston had used to get these strips of pigeon breast so unbelievably tender and tasty, but the results were truly spectacular. With a rich ale sauce complimented with some sharp (and neatly carved) artichoke hearts, this was another completely stunning, expertly crafted dish. 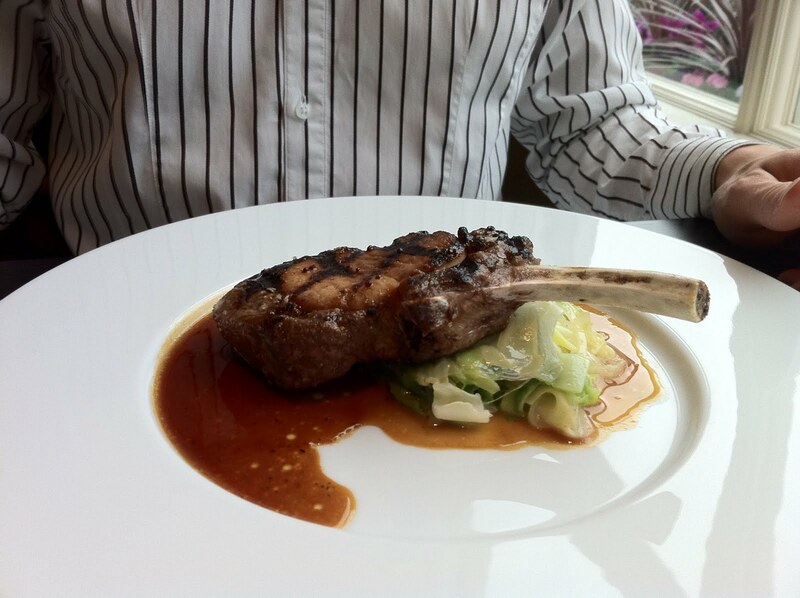 This generously proportioned pork chop was grilled over charcoal to get a lovely smoky, crispy char and served over buttered cabbage. A much simpler dish than the others perhaps but no less tasty - I can't think of any restaurant other than London's top two steakhouses (Hawksmoor and Goodman) to use flame-grilling to such good effect - the fat was crisp and salty, the flesh tender and barely pink. Perfect. If the starters and mains were impressive, desserts were out of this world. 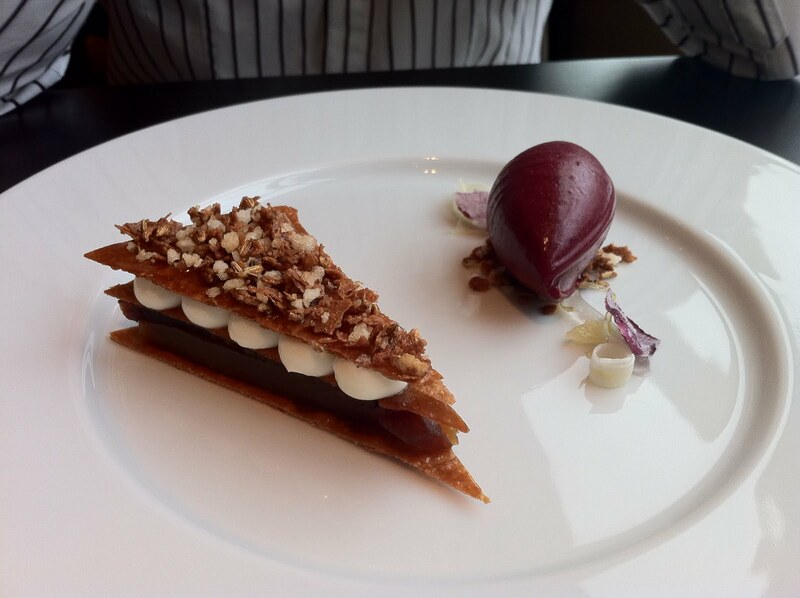 Taffetty Tart was a dish I'd been served in a slightly modified format at that Fat Duck last year, but here it was even better than I remembered, the carefully constructed layers of caramel and fruit paste served with a truly incredible blackberry sorbet. 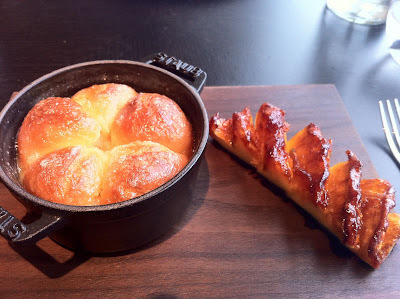 And yes, the spit-roast pineapple tasted every bit as good as its 30 minute cooking time would suggest (we had to order it along with the savoury courses to give them enough time to prepare), served alongside a heavenly alcoholic brioche "tipsy cake". We never wanted it to end. In an effort to delay the inevitable, we dragged our heels with a very good British & Irish cheese board, and once that was polished off were pleasantly surprised with a final petit for of Earl Grey caramel with caraway seed shortbread to dip in it. Like everything else, it was carefully considered, artfully prepared and brimming with fun and invention. There was, of course, the final matter of the bill. With only one glass of wine each it came to just short of £160 for two, which of course is not a cheap lunch, not by a long way. But it is no word of an exaggeration that the food at Dinner, while perhaps not as mind-bogglingly intricate and theatrical as the multi-course tasting menu at the Fat Duck, comes from the same wonderful place creatively and still felt like the bargain of the century once we'd paid up and rolled happily home. The sheer effort, attention to detail and astonishing skill that went into every single element of the dishes we ate on Saturday, as well as service from a front of house team that were as attentive and knowledgable as you could ever hope for, made the whole experience a complete joy from start to finish. It may be irritatingly over-exposed, it may be depressingly over-subscribed, but it's both those things for a very good reason. Believe the hype.